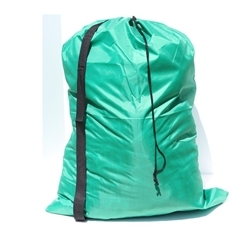 This is our CARRYING SHOULDER STRAP polyester green laundry bag. It is 30" wide x 40" long and has a simple to use slip lock closure. All you do is push the button and slide the lock closure down the rope. The bag is a darker green then shown. We will be changing the photo soon. TEMPORARILY OUT OF STOCK. Available again in April. Call to preorder.